Welcome to the personal page of Chris Haji-Michael. 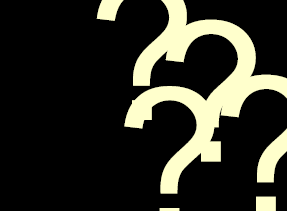 If you have any comments, then please contact me at email5@sunshadow.co.uk. This page contains a number of technical simulation files that you may download and freely use, but naturally I accept no responsibility for any errors. All I ask, is if you improve or update any of these files that you return these to me for inclusion here. 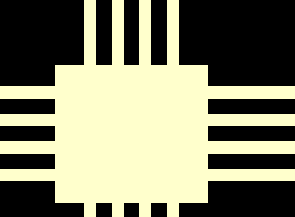 I am an RFIC (radio frequency integrated circuit) and RF system design engineer for NXP Semiconductors in Graz, Austria, where the company designs a range of low power short range RF devices. It is a great place to live and work. My MathCAD Files, all 2001 format. I returned to university (Sept 2003 to July 2004) to study the second year of a Masters course in Radio Frequency Integrated Circuits (RFIC) at AAlborg University in Denmark. My project was to design, layout and test a lossless-feedback amplifier on a CMOS Integrated Circuit to work at 1.5 to 2GHz. 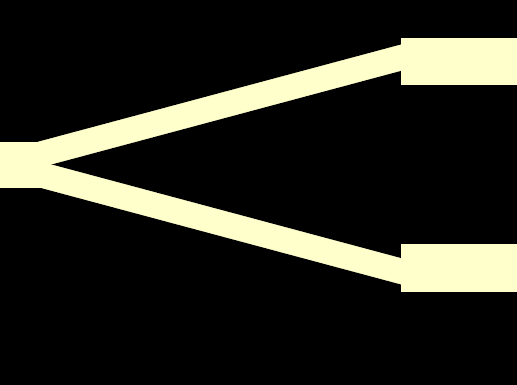 The feedback improves the amplifier linearity without degrading the amplifier noise figure. 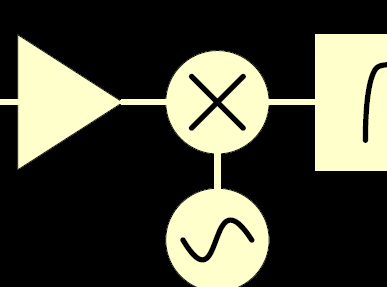 This is the first time that such an amplifier has been built above 200MHz and also the first time that these transformer directional couplers were built on an IC. You can download my thesis (20 Meg) from here. 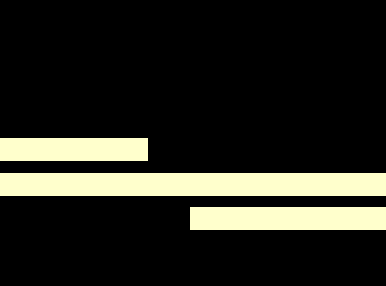 Discrete component splitter (80k). 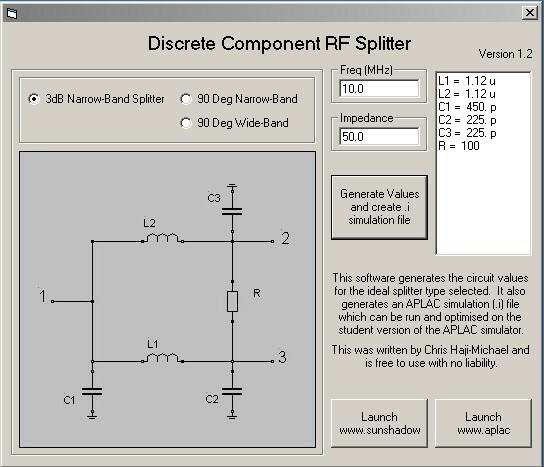 Easy to use GUI software to design passive component Wilkinson or Quad splitters. It generates an Aplac (.i) simulation file. Free to use. Screenshot. Filter Design (120k). 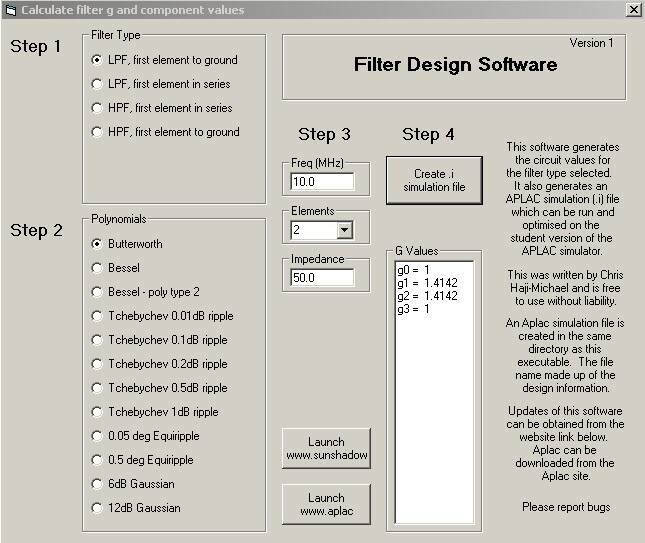 Another easy to use GUI software to design passive LC filters and to create an Aplac (.i) simulation file. Free to use; Likely to be updated over the next few months. Screenshot. A student version of Aplac is available. This is a very powerful spice type simulator with lots of RF circuit features including microstrip and coupled lines. I find the software painful to use, but getting better with each release; For home use it is great. To run these on version 7.9 and above you need to select 'simulation' from the pull down menus as these files are written in the text format.